Filled with laughs, machine guns and a lot of explosions, this 117-minute PG-13 homage to the classic 1980s show is a must see for the whole family. 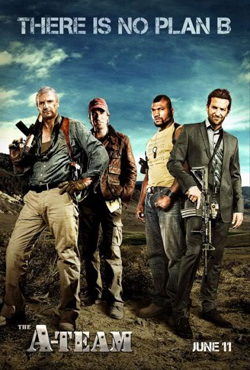 Directed by Joe Carnahan, the movie opens with a bit of the team’s history and how it got together. Then the story moves quickly into the base plot of the old show. The team members are set up to take the fall for a crime, escape prison, and sets out to right the wrong and clear their names. The team consists of tactical genius Hannibal Smith (Liam Neeson), clinically insane pilot H.M. “Howling Mad” Murdoch (Sharlto Copley), strong man and mechanic Bosco “B.A.” Baracus (Quinton “Rampage” Jones) and con man and womanizer Templeton “Face” Peck (Bradley Cooper). The special effects are ridiculously over the top, yet they support the movie easily. For most movies, cramming a ton of explosions into two hours would be the kiss of death. But in this movie, it feels completely natural. The over-the-top effects seem believable within the story’s framework. And the most impossible stunts — ranging from flying a helicopter upside down and using car airbags as flotation devices to dogfighting jets with a tank — are impeccably and hilariously downplayed as all in a day’s work for the team. Nearly every member of the cast turns in a flawless performance as each of their respective characters. Neeson, known for strong paternal warrior roles like Qui-Gon Jinn of Star Wars, is the perfect choice as Hannibal Smith. Copley, having taken on a serious role in the drama “District 9”, shows off amazing comedic skills in his portrayal of “Mad” Murdoch. Cooper gives a strong performance as the character Face, but the portrayal bears only a passing resemblance to the womanizing con man of the TV series. But the changes work, and Cooper makes the character his own. The plot is terribly cliche. Everything, from base story to plot twists, is classic B-action movie. But far from dragging the movie down in the gutter, the clichés give a tongue-in-cheek feel. This is a movie that knows it’s cliché, but is having too much fun to care. “The A-team” is not the kind of movie you go see to make you think. There are no real ethical or moral themes, no intelligent societal questions posed. This is the one you go see because explosions are fun, and you need a good laugh.